These mini blocks are made of a highly durable rodent bait specifically developed to deliver the highest in protection against bait crumbling, scattering, melting, or molding in commercial locations where humid, moist or extremely hot environments exist, and/or where third party audits are common. The existing durability of BlueMax also minimizes the need to constantly replace bait in these extreme temperatures. The unique formula Blue Max utilizes also uses the active ingredient difethialone, the industry's most advanced single-feed anticoagulant. Difethialone is a unique compound that takes only half the rate (25 ppm) of other anticoagulant rodenticides to kill rodents. A lower rate of that active ingredient makes BlueMax more appetizing to the rodent, and so is accepted much more, being less detectable to the rodents. 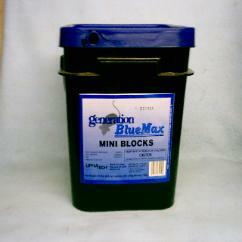 Would you like to see the Generation Blue Max Mini Blocks Label? How About The Generation Blue Max Mini Blocks MSDS sheet?